Our School uniform characterizes us a school community and identifies us distinctly as belonging to Saint Joan of Arc C.H.S. The student uniform also helps to ensure a safe learning and teaching environment. A long or short sleeved SJA-embroidered golf shirt must be worn at all times. Full Zip sweater (optional); if worn, only the golf shirt can be worn underneath. 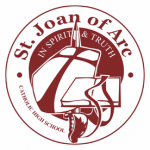 Students who enroll at Saint Joan of Arc C.H.S do so with a full awareness of the uniform expectations and agree to abide by the uniform dress code. Students are expected to be in proper uniform at all times throughout the school day (8:20 a.m. to 2:21 p.m.) including the lunch periods. Students in our Co-operative Education and/or Alternative Education Programs, as well as students with a Study Hall, must be in full and proper uniform throughout the instructional day. Students are also required to be in full and proper uniform during school field trips unless arrangements have been previously made with Administration. Over the last few years, many students have deviated from the required items despite our efforts and the Code of Conduct. As a result, effective September 2013, all students will be required to wear the “SJA” – crested black dress pants. “Civies Day” clothing that is revealing and/or that contains obscene/rude images or slogans is not allowed. Any disagreement about clothing that cannot be settled amicably will be referred to the School Administration for a final decision. Students who do not comply with our Saint Joan of Arc C.H.S. uniform expectations will be sent home and/or suspended from school.